According to the American Association of Pediatric Dentistry, your child should have their first dental visit either within six months of developing their first tooth or by their first birthday. 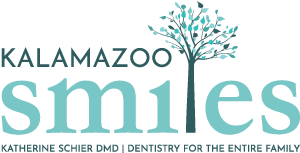 At Kalamazoo Smiles, our pediatric dentist is here to help you get your child’s oral health started on the right foot. Ad Kalamazoo Smiles, our team is experienced with patients of all ages. We’ll do our part to make your child’s dental visit a safe, comfortable, and positive experience for you and your child. At each pediatric dental visit, we will thoroughly clean your child’s teeth and check their mouth for any potential problems such as tooth decay or gum disease. Our Kalamazoo pediatric dentist will answer any questions you might have about your child’s oral health and will show both you and your child how to care for baby teeth. Help your child have a lifetime of healthy teeth and gums! Their first pediatric dental visit is an important step in their growth and development. Contact our Kalamazoo, MI dentist at Kalamazoo Smiles by calling (269) 353-3700 to request a pediatric dental exam for your child.